To allow the motor to be controlled from your BS2, you can simply turn the transistor on and off by programming the pin to go high and low. You will notice that this drives the motor to be on at full speed and then off for a period of time, conditioned by the pause cycle. What if you wanted to control the speed of the motor? The next program will show you how to use the TIP 120 and PWM (pulse width modulation) to speed up and slow down the motor. PWM code makes a pin output high at 5 volts and then low at 0 volts for as many cycles as you want. When you turn the pin on and off quickly, you create an output from your BS2 that is high (5v) half the time and low (0v) half the time. Using PWM you can create an average voltage that varies between 0 and 5 volts. If you are at 5 volts for 50% of the time and at 0 volts 50% of the time, then the average voltage would be 2.5 volts over time. Well, what if you wanted an average voltage of 1 volt for a slower speed? • PWM converts a stream of digital signals to analog output via pulse-width modulation. • Pin is a variable or a constant expression between 0 and 15 (the pin numbers). • Duty is a variable, constant, or expression between 0 and 255 that determines the output level between 0 to 5 volts. • Cycle is a variable, constant, or expression between 0 and 255 that determines the length of time the PWM signal is on. PWM sends a burst of ones and zeros (5 and 0 volts at output) and the ratio is proportional to the duty you specify. The proportion of ones to zeros in PWM is then called the duty cycle. In the next program, you will be using PWM to start the motor off slowly and then to speed it up and slow it down again. Enter the program below and hit run. 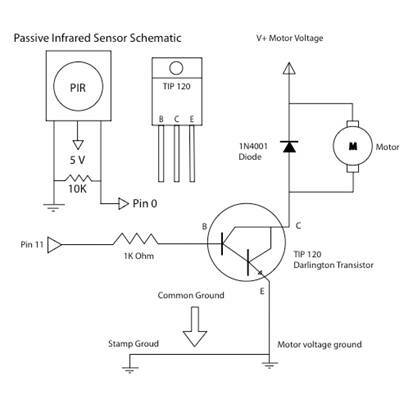 In this next lesson, you will be using a PIR (passive infrared sensor) to sense your infrared heat. This sensor will then allow you to use the PIR to turn the motor on from a distance of 1 to 8 feet. 1 DC motor either a gearhead motor or a small DC motor scrapped from a surplus machine. If you are using surplus motor make sure you are dealing with a DC motor. 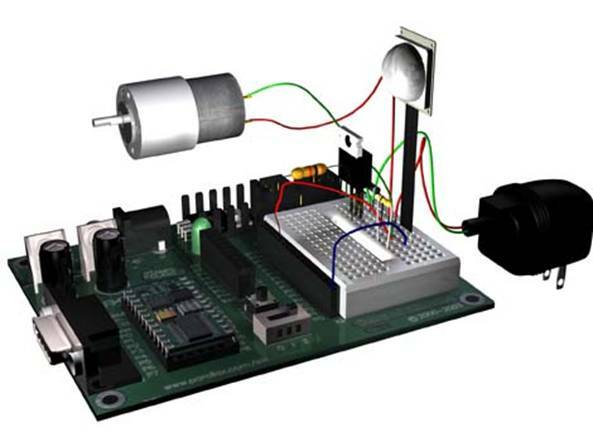 This application will not work with a servo or stepper motor or low power AC motor. Refer to chapter 16 on Motors and Muscles for further information on the differences between these motors. 1 12-volt power supply for motor power. Leaving the TIP 120 and motor driving circuit in place, add the PIR circuit below. Place PIR in the board as above. Be very careful to have the sensor polarities correct for power and ground. You may notice on the back of the sensor in small writing where the 3 wires meet the board that it says V+, OUT and GND. Wire in the 10k ohm resistor between the ground and the out pin of the PIR. Connect the ground pin of the PIR to the board’s ground with a connector wire. Connect the OUT pin of the PIR to pin 0 on the board. In this program you will learn to program the PIR sensor to activate the motor. You can have the motor spin for as long as you like, but by leaving the motor on for 80 milliseconds, the system is a bit more responsive. This sensor is designed to be activated by infrared in the frequency of human body heat, but you can also activate this sensor by putting it in break-beam configuration, as in Chapter 9. One way to increase the range of the sensor is to point the sensor toward a light so that when even a non-infrared oriented object passes in front of the sensor, it will be activated. Remember, it takes some time for the PIR to warm up. INPUT 0 ‘define 0 as input and 11 as output.